After experimenting with companying planting, we build a 'trough case': a semi-underground 'plant greenhouse' based on a design by Pieter Boxman, a pioneer in the field of biological horticulture. 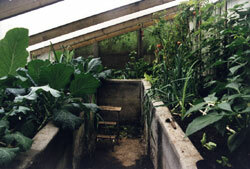 The plant beds lie approximately 1 meter below the surface, and people can, via a staircase entrance, walk between the beds. In the climate in the Netherlands, the approximately 4-month-long growing season has been doubled and we are picking tomatoes and grapes in December! are ready for picking early in the year.